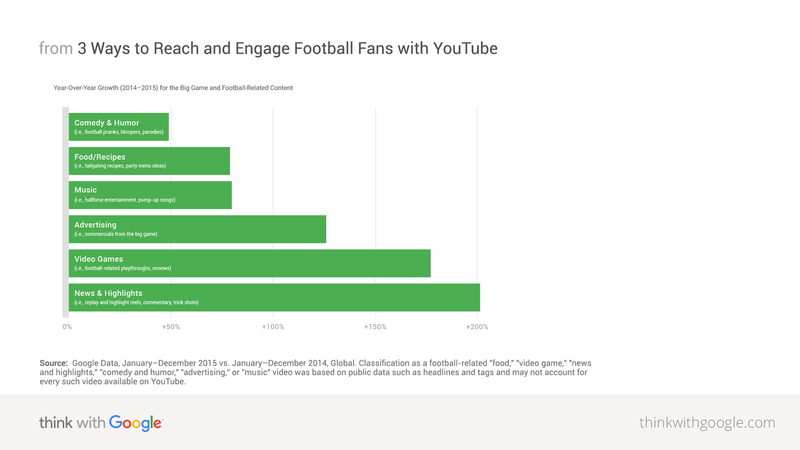 New data reveals when and why football fans tune in to YouTube for football content. Find out the best ways your brand can connect with football fans around the big game and beyond, through an entire season of opportunities. The big game is just around the corner, which means marketers and fans alike are getting ready for the most-watched television event of the year. About 110 million viewers have tuned in to the broadcast every year since 2011.1 But, for advertisers hoping to reach football fans, the big game itself is only a few hours in an entire season of opportunities. But football fans don't just turn to YouTube for sports content. YouTube is the fan favorite for finding everything football-related, from the highlights of last week's game to a hilariously bad lip reading of sideline comments. To examine how fans consume online video during the millions of I-want-to-know, I want-to-do, I-want-to-buy, and I-want-to-watch-what-I'm-into moments that occur throughout the season, we analyzed YouTube viewing behaviors. 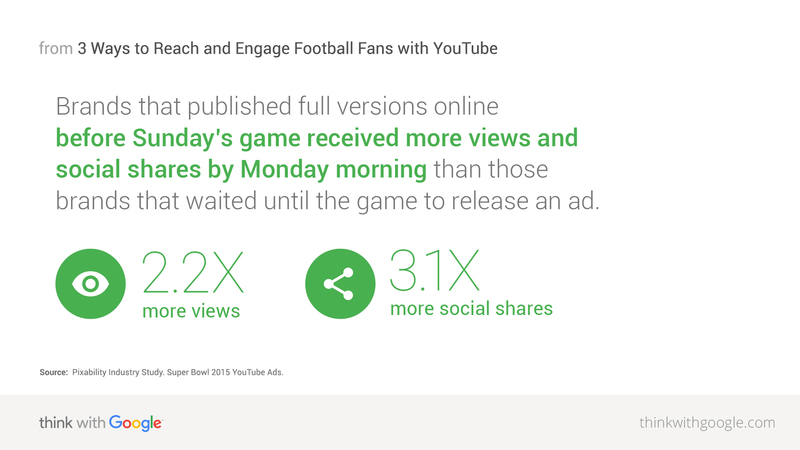 Here are three key insights to help you reach and engage football fans. Source: Pixability Industry Study. Super Bowl 2015 YouTube Ads. The best way to boost viewership of a Super Bowl ad? Post it before game day. According to an analysis by Pixability of last year's commercials, brands that published full versions on YouTube before Sunday's game received an average of 2.2X more views and 3.1X more social shares by Monday morning than those brands that waited until the game to release an ad.6 The year's most-watched ad in Pixability's study was Budweiser's "Lost Dog," which was posted five days before kickoff and garnered more than 18 million views before the game. Source: Google Data, January–December 2015, United States. Classification as a "football" video was based on public data such as headlines, tags, etc., and may not account for every "football" video available on YouTube. It's no surprise that football fans turn to YouTube for game-day highlight reels, commentator analyses, and historic game clips. But there's also opportunity to engage football fans in their I-want-to-know, I-want-to-do, and I-want-to-watch-what-I'm-into moments less directly related to the game itself. Video Micro-Moments: What Do They Mean for Your Video Strategy? There's a vast range of videos that tie to the big game that can serve as inspiration for brands as they think about creating content that will engage football fans. From football-related tricks like Dude Perfect's Slip 'n Slide Football Battle to the perfect football DIY treats from Rosanna Pansino, there's a variety of subcategories of football-related content that are growing on YouTube. Google Data, January–December 2015 vs. January–December 2014, Global. Classification as a football-related "food," "video game," "news and highlights," "comedy and humor," "advertising," or "music" video was based on public data such as headlines and tags and may not account for every such video available on YouTube. Of course, football fans aren't only watching football (or related) content. Their interests vary and the types of content they watch on YouTube is equally diverse. Nissan put these lessons into practice for its #withdad Super Bowl campaign in 2015. Not only did Nissan take advantage of the excitement in the lead-up to the big game on YouTube, but it also thought well beyond football-related content when it came to landing the Nissan message. In the weeks before the Super Bowl, Nissan partnered with popular YouTube creators, asking them to create content celebrating how dads make life better for their families. By tapping into the likes of Roman Atwood, Epic Meal Time, and Convos with My 2-Year-Old (among others), Nissan ensured the content would be seen by a much broader audience of football fans than if it had focused on football content alone. The videos—with more than 76 million views to date11—were also a savvy way to build suspense for Nissan's first televised Super Bowl ad in nearly 20 years, which was voted the fan favorite in YouTube's AdBlitz. As the big game has evolved into the big month—and the football season into an all-year affair—the opportunity for advertisers looking to connect with football fans has expanded. 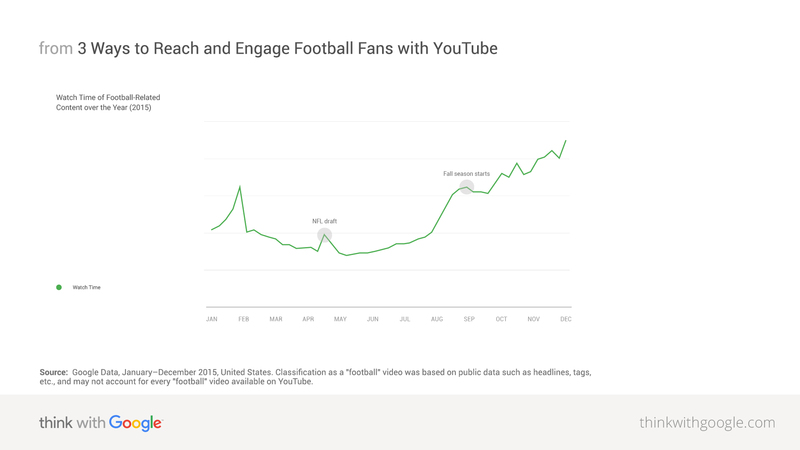 By understanding what types of video content football fans turn to in their video micro-moments, brands can find opportunities to connect, engage, and remain relevant and useful from the season's kickoff to its grand finale. 1 Nielsen NNTV Program Report 2015, Nielsen historical data. 2 YouTube Super Bowl Report. Google / Ipsos MediaCT, Ipsos Online Omnibus, December 2015, N=2014 U.S. online respondents 18+. 3 Google data as of Jan 5th 2016. Global. Classification as a "American football" video was based on public data such as headlines, tags, etc., and may not account for every such video available on YouTube. 4 Google Data, January 1, 2015–February 1, 2015. Classification as a big game ad was based on public data such as headlines, tags, etc., and may not account for every such video available on YouTube. 5 Google Data. Global. Jan–Feb 2015. Classification as a big game ad was based on public data such as headlines, tags, etc., and may not account for every such video available on YouTube. 6 Pixability Industry Study. Super Bowl 2015 YouTube Ads. 7 Google Data, January–December 2015, United States. Classification as a "football" video was based on public data such as headlines, tags, etc., and may not account for every "football" video available on YouTube. 8 Google Data, January 2014–December 2015, vs. January–December 2014, Global. Classification as a football related "comedy and humor" video was based on public data such as headlines, tags, etc., and may not account for every such video available on YouTube. 9 Google Data, January–February 2015, United States. Search results that drove to football related food and recipe content. 10 Google Data, December 2015, United States. Google-defined lifestyle, psychographic and behavioral audiences based on user browsing behavior on the Google Display Network. 11 Google Data. Analysis of global view counts of these videos.